Pax Earth Japan President Dr. Soko Aoki visited Nepal from September 8, 2013 to September 12, 2013. 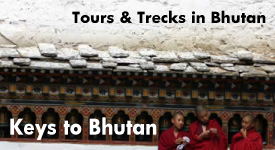 The main objectives of his visit were to conduct a project cycle management (PCM) workshop with the stakeholders in Kot Timal village and shoot panorama videos in Nagarkot and Panauti: two popular tourist destinations situated near from Kathmandu valley. He brought hands on knowledge on conducting PCM workshop attending the training organised by JICA in Japan recently. Similarly, he has brought all the equipments required to shoot panorama videos. 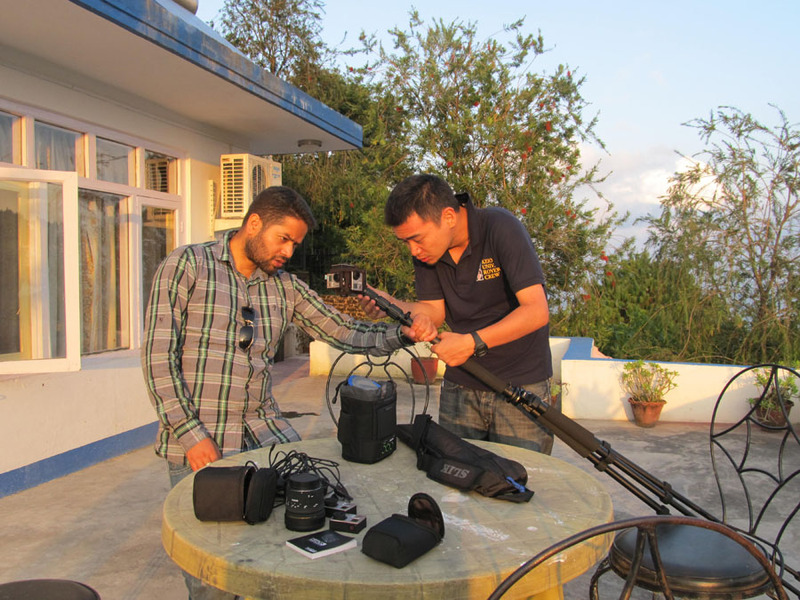 According to his plan, Pax Earth Nepal managed to conduct the PCM workshop with the stakeholders in Kot Timal village and also helped in taking panorama videos in Nagarkot and Panauti. Here is a brief report of his visit. President Dr. Soko Aoki landed at Tribhuvan International Airport, Kathmandu at 12:45pm on September 8. He was warmly welcomed at the airport by PEN Secretary Binod P. Mainali, Treasurer Bal Gopal Shrestha and Board Member Manohar Sapkota. He was then taken to Fuji Hotel located at Thamel, Kathmandu. At 4:00pm, preparation meeting for PCM workshop was held at Fuji Hotel, Kathmandu. In the meeting, along with President Aoki, PEN President Sujan Koirala, Secretary Binod P. Mainali, Treasurer Bal Gopal Shrestha, Board Members: Laxman Bahadur Pahari, Kamala Basnet and Manohar Sapkota; and Pax IV Hyper members: Keisuke Uchida, Hirotada Ikegami, Mizuki Suzumura, Hayate Harashina and Yoshiro Yamamoto were present. President Aoki had gained a practical knowledge on conducting a PCM workshop attending a PCM workshop training organised by JICA in Japan recently. He shared how to conduct it. The participants practiced stakeholder analysis, problem analysis and purpose/solution analysis under his coordination. 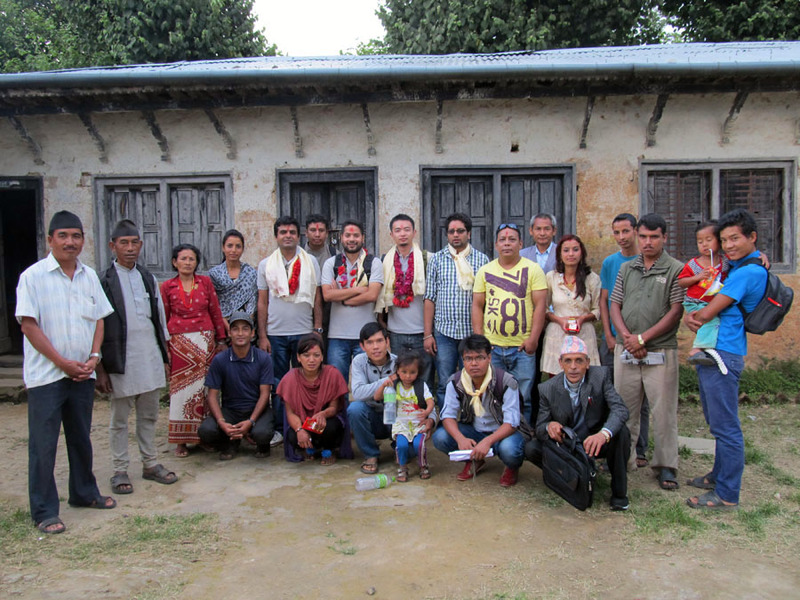 On September 9, a 16-member Pax Earth team comprised of President Koirala, President Aoki, Country Representative (CR) for Australia Saroj Ghimire, Pax Earth members and Pax IV Hyper members traveled to Kot Timal village of Kavrepalanchok and conducted a PCM workshop with the stakeholders. The main objective of the workshop was to discover major problems in the village. The workshop was attended by 14 stakeholders including parents, teachers, ward representatives, social workers, businessmen, employee, farmers and a Pax Earth member. These stakeholders were divided into three teams and conducted the detailed problem analysis and purpose/solution analysis. The workshop identified three major problems in the village: (i) water (ii) agriculture and (iii) health. Problem tree and purpose/solution tree under each heading was prepared and comprehensively discussed. Among these three problems, the water has come as the topmost problem which needs to be tackled at the earliest. Most of the stakeholders agreed if the water problem can be resolved, it would help address more than 50% problems associated with agriculture and health. In the same visit, Pax Earth distributed educational materials (carrying bags, notebooks, pencils, ball point pens, erasers and sharpeners) to underprivileged students of Shree Raktakali Primary School and Shree Kalika Primary School. More than 120 underprivileged children and 10 teachers of these two schools benefited with this distribution. On September 10, President Aoki, President Koirala and Pax IV Hyper members Keisuke Uchida, Hirotada Ikegami, Mizuki Suzumura, Hayate Harashina and Yoshiro Yamamoto had a breakfast meeting with Ramon Magsaysay awardee Dr. Mahabir Pun in a fast-food restaurant in Kathmandu. Dr. Pun shared how he implemented wireless technology and changed the livelihood of the villagers in the mountain regions. He also shared what he has been doing currently. He mentioned about a trekker tracking device which is going to be launched in the Annapurna region. After the meeting, Pax IV Hyper members returned to Fuji Hotel while President Aoki and President Koirala went to meet Mr. Ngima Dorji Sherpa, Managing Director of Nepal Myths and Mountains Trial Pvt. Ltd. at his office in Kathmandu. 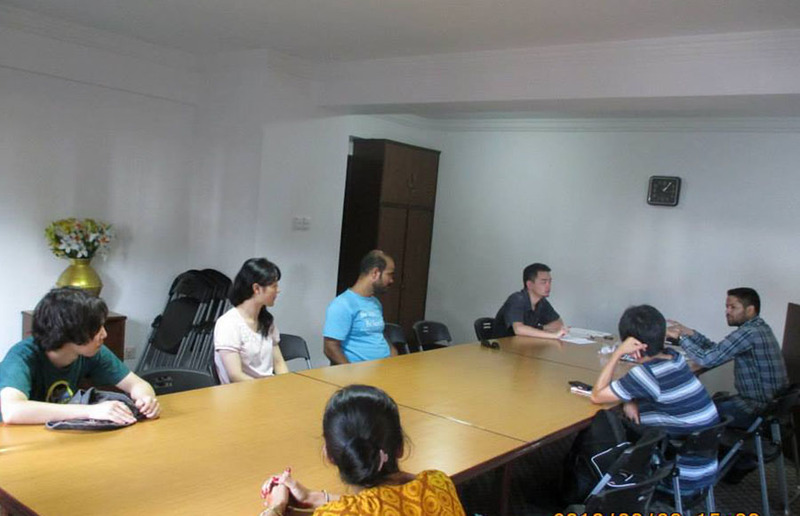 The meeting discussed on the possibility of a social business collaboration among Kadinche Corporation, Pax Earth and Nepal Myths and Mountains Trail Pvt. Ltd. In the afternoon, a small Pax team comprised of President Aoki, President Koirala, Treasurer Shrestha and Board Member Pahari traveled to Nagarkot in a cab. 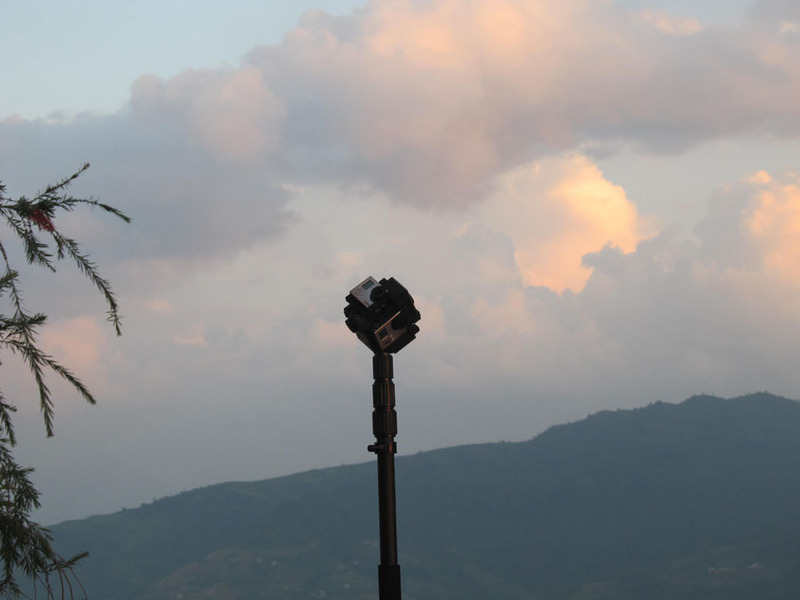 President Aoki took panorama video of the Nagarkot region. Secretary Mainali and Board Member Sapkota joined in the evening. All Pax Earth members took a dinner at Hotel Space Mountain and stayed overnight. On September 11, President Aoki and President Koirala woke up early and took the panorama video of the sunrise and mountain range. After having breakfast, they along with Treasurer Shrestha and Board Member Pahari left for Panauti while Secretary Mainali and Board Member Sapkota left for Kathmandu. President Aoki took some panorama videos of Panauti region. 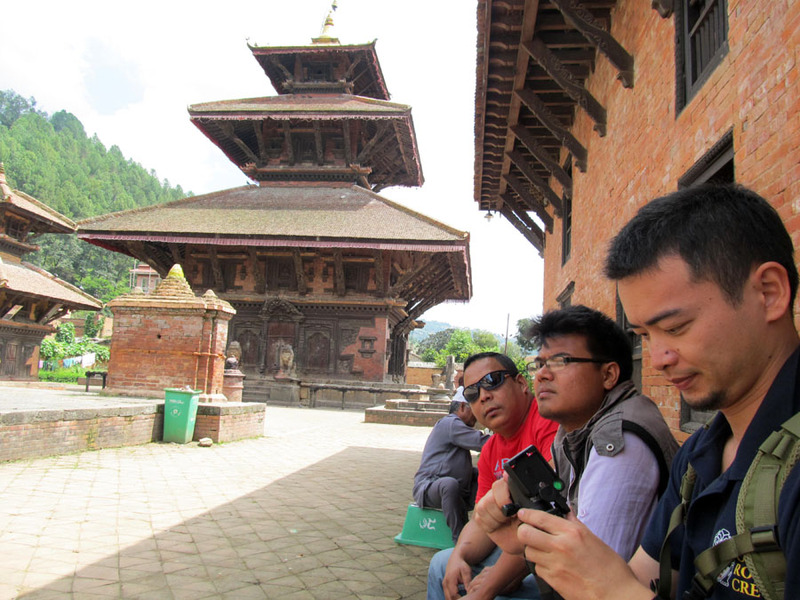 On the way back to Kathmandu, they could manage to stop at Banepa for lunch. 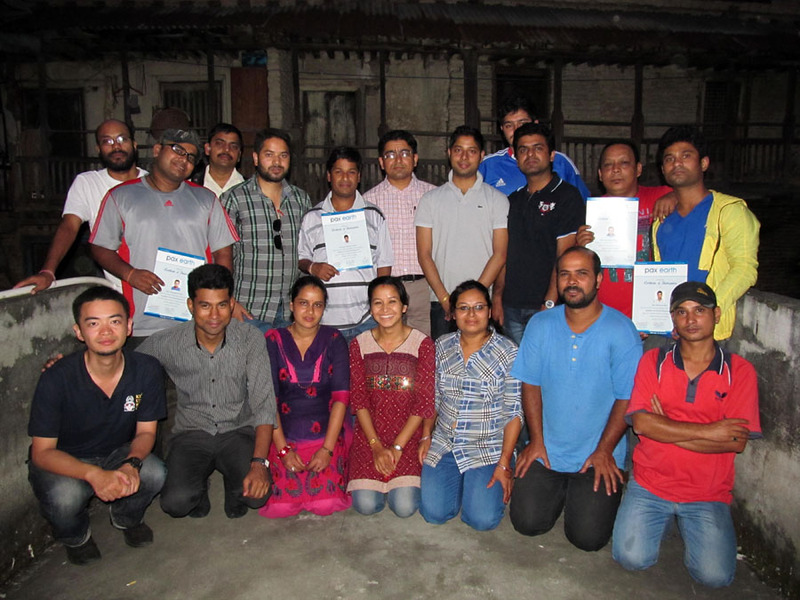 In the evening, a joint meeting of PEN and PEJ was called at PEN Secretariat, Pashupati, Kathmandu. More than 20 Pax Earth members were gathered at the meeting. From PEN, President Sujan Koirala, Hon. Member Nilambar Badal, Country Representative for Australia Saroj Ghimire, Vice President Shreebatsa Basnyat, Secretary Binod P. Mainali, Treasurer Bal Gopal Shrestha, Board Members: Harihar Sapkota, Kamala Basnet, Laxman B. Pahari, Members: Debraj Ghimire, Sachin Koirala, Peter Badal, Dev Raj Karki, Ram Sharan Paudel, Sovanand Yadav, Jamuna Siwakoti, Manisha Chalise, Dina Nath Ray and Ramji Bhattarai were present at the meeting while President Soko Aoki represented PEJ. They discussed on past and current activities, strategy and future course of action of Pax Earth. Many new comers were excited to meet and interact with President Aoki. There was a question answer session too. President (PEN and PEJ) answered to the queries raised by the members. Taking a special time, CR for Australia Ghimire shared how he was inspired to join Pax Earth and serve people. He felt privileged to serve poor and needy children through Pax Earth. He has been supporting Pax Earth by raising some fund from Australia for the past three years. In this year too, he had raised a small fund for Pax Earth organising a get together of his close friends in Australia. 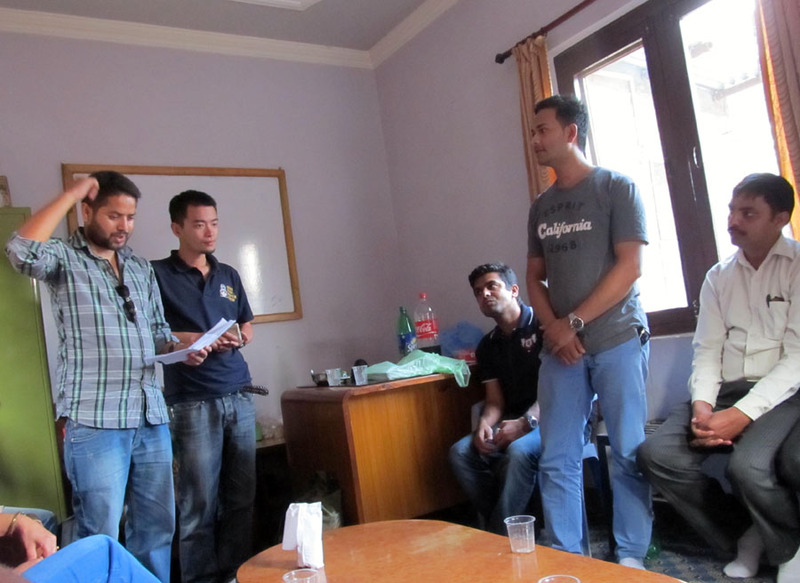 Including CR Ghimire, 14 Nepali friends in Australia raised Australian Dollar 280.00 (equivalent to Nepali Rs. 25,200.00). He handed this fund to Pax Earth through his brother Debraj Ghimire and President Aoki received it on behalf of Pax Earth. In the same meeting, President Aoki handed certificates of appreciation/participation to the best speakers of Toastmasters program and participants of Members Outdoor Exposure and English language courses. Unfortunately, there was a general strike called by an alliance of 33 opposition party on September 12. In the morning, President Koirala went to see President Aoki at Fuji Hotel on foot. They had a cup of tea at the hotel. Due to the general strike, finding a vehicle was quite difficult. After waiting a long time, they could manage to find a car and left for Tribhuvan International Airport. Secretary Mainali and Treasurer Shrestha joined them at the airport. President Koirala, Secretary Mainali and Treasurer Shrestha jointly bid him farewell at the airport at 11:30am. In this way, his short and sweet visit came to an end. He could fulfill main objectives of his visit with the cooperation of PEN members. His visit was efficiently coordinated by President Koirala.